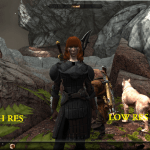 Dragon Age 2 for the PC is a completely different experience to the console versions of the game. As a game, it feels as though it was built with the PC in mind and everything about it is reminiscent of the PC titles of old. 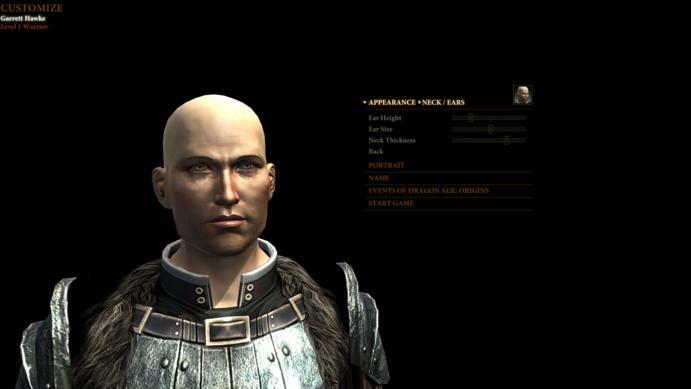 It has most features that a player would expect from a PC RPG title as well as a huge story, which is both interesting and compelling, along with a superior graphical experience only available to PC owners (as well as an optional higher definition graphics pack); the PC version of DA2 is the superior experience. Though, for this review, I have the game running un-patched and without the HD textures applied. I did patch the HD graphics into the game to take a few of the later screenshots, but all of this is written with my default settings taken into account (everything at maximum settings except the anti-aliasing and the anti-strophic filtering, with the AA being at 4X and AF being at 0). Loving the graphical fidelity of this game. The game follows the story of the champion, a character with the last name Hawke. Players take on the role of Hawke, who’s first name and appearance is fully customisable to the player (assuming they choose a customisable version of Hawke after the initial tutorial mission), and unfold/create the story (as its a roleplaying game with multiple choices) which is told by protagonist Varric during some kind of interrogation by a templar woman. Character creation for my Warrior. The story follows Hawke as he/she starts their journey as a refugee from Fereldan with no money and no hope until they reach the status of the champion. Taking place nearly entirely within the city of Kirkwall, the story follows the relationship of Hawke with his/her campanions, making it a personal journey of love, hope, friendship and thrills. For each player it is likely that the story will vary in some way considering the amount of branching options that appear in the game, though the overall story will be pretty similar. To show my point in this, during the character creation sequence, players will be able to import a saved game from ‘Dragon Age: Origins’; which affects some of the background lore of the world as well as some of the events within the game. The good thing about this feature is that players can import saved files regardless of the progress within the imported file. If the game is complete it will use all of the flagged data to build the world, whereas, if the game was not completed, then it will add a default set of events based on the stuff that was missed in the previous games. This feature already makes the story different for each player. The story can also be manipulated by other in-game events, such as: during the inevitable expedition into an ancient Dwarven mine, depending on who you take with you, you can have a party member permanently be killed off. As per quest based games, some of the companions that you are supposed to acquire can be skipped over, making it so that that particular party member never joins you; which would also manipulate the story. We cannot pass over a mountain. Let us go under it! Let us go through the Mines of Moria! – Gimli, Lord of the Rings. While I do talk a lot about the freedoms of choice within the story, it sometimes feels like there was some rail-roading going on (which is true of all RPG games) especially early on during the story. Like when you recruited by Varric to join the expedition, there is no ‘No’ option. It would have been nice if I was able to skip the expedition that early on or even kill Varric myself, not that he’s annoying or anything, I just would like to see some really awesome freedom in a role-playing game. The rail-roading only really appears with major plot points, though more minor ones usually have a ‘Kill everyone’ option, which is pretty cool. I suppose that if you’ve designed a game with a massive story, you would want players to experience that story, rather then have them murder everyone important and then end up with nothing to do. As a Dungeon Master, I understand this conundrum all too-well. 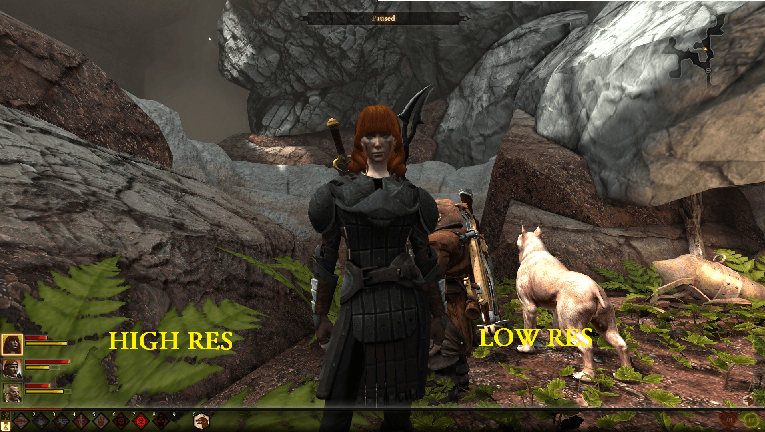 The gameplay in Dragon Age 2 for the PC is quite different to the console versions. I mean, sure you run around and complete quests and sure you use skills to best enemies, but the way you do so is a bit different. 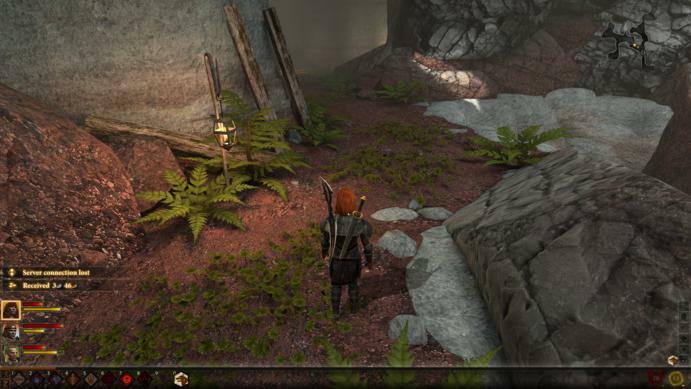 On the PC version of the game, skills are mapped to a quickbar at the bottom of the screen which allows you to use whichever skill you deem necessary for the situation that you are placed in. 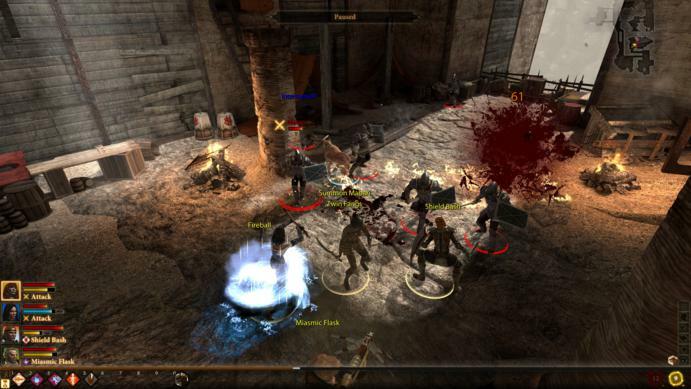 Another notable addition is the ability to pause combat. With these two implementations the game becomes a lot more tactical, while also retaining the visceral combat of the consoles. For instance, your party is jumped by a group of thugs in Lowtown during the night. You hit the spacebar to pause combat so that you can get a decent overview of what it is that you’re facing. While paused, you look about and come up with a tactical solution to the battle that’s about to ensue. You have your Warrior target the center of the group and cast taunt, so that they all attack her. You unpause and watch your party auto-attack the nearest enemy, while the tank runs through and grabs all opponents in range of her taunt. You then pause the combat while the tank is being hammered on. You select the mage, hit up the firestorm, targeting all enemies around the tanking warrior, you also select your ranged Rogue and have them cast an aoe ranged attack. Hit the spacebar and watch as all enemies in that area get blasted to death, while your melee rogue runs around and auto-attacks them in the back. Visually this is quite an awesome sight to behold with bits of enemies flying everywhere while others are being burned to death. Amazing. A more tactical way of playing, which is an advantage. If you feel like it, there is also a method to control all of your parties movements at once for even greater tactical control of the game. This becomes important with, at the very least, one of the boss fights during the game. I’m certain that at harder difficulty levels, it will be one of the many things that you consider in each battle, regardless of their importance to the story. As the game progresses, tactics begin to take an important part of the combat experience, even on easier difficulties. So it pays to always think tactically, even in some of the easier fights. I’ve hit the game over screen a few times on Normal difficulty in fights that I thought wouldn’t be too difficult, simply because of the un-advantageous set-up of the fight and the poor positioning of my units. 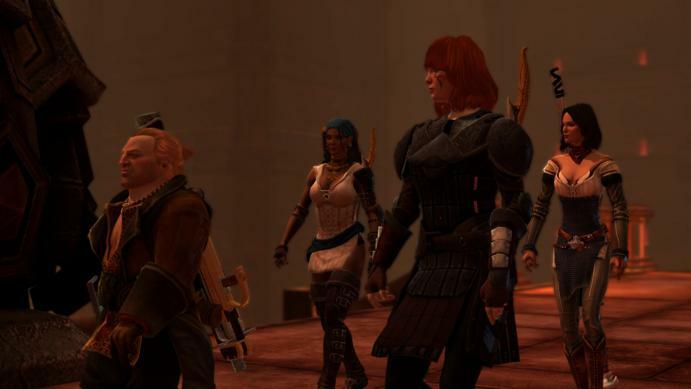 If you recall in Dragon Age: Origins, the dialogue was conveyed in a more classic Bioware manner with there being up to 10 different dialogue options in a list, with about three different variations on what the opposing character could respond with. So gone is this older method and its replacement has been brought in. That replacement is the dialogue wheel from the Mass Effect series. Functionally it is the same, but there are some additions to it. In the centre of the wheel is an icon which pertains to the current piece of dialogue that you have selected. These range from a kind of angelic symbol for Good type responses to dual swords for combat related options. There are also investigative type option to the left. Dialogue wheel as lifted from ME2, only it shows the meaning behind the words. The one thing that I enjoyed about DA2 is that the dialogue has no bearing on your character, as there is no alignmental tracking within the game. This makes for a more personal roleplaying experience as you’ll be able to choose what you think is best for the situation that you’re presented with. While this prevents players from creating a truly good character or a truly bad character (at least from a statistical point of view), it does make the choices feel more personal and allows players to feel more connected with their character and, through their characters, the world around them. There are so many features to talk about with this game and another of those would be the AI behaviour commands for team-mates. Using the menu interface, you can assign a type of behaviour for your team-mates to use. These range from a series of default behaviours to a custom behaviour that players can fully modify to have each companion play the way the player wants them to. As for myself, I use a combination of default behaviours and customisable behaviours depending on what I need from each companion. For instance, I had Varric use default ranged behaviour, whereas, I had Bethany with a custom behaviour to better ultilise the skills I wanted her to use. The dungeons in Dragon Age 2 are where most of the external quests take place, but unfortunately for the game, a lot of them are re-used. Though, story-wise, they are used in similar locales. Gameplay-wise, it is just unvaried and it feels very repetitive. Though, this repetition is only really in the minor dungeons and each main dungeon does have a unique and feel to them. It’s just unfortunate that these dungeons are towards the end of each story arc and are spaced between the minor dungeons. Another gripe is that in some of these dungeons you can’t even explore the entirety of these areas as they are artificially blocked off by carts, crates and/or un-openable doors. If I see a wooden cart blocking my path, why cant I chop the wood to pieces in order to travel forwards? This really takes away from the feel of adventure and adds to the rail-roading that I mentioned earlier. While it’s not a deal-breaker, it does take away from what could have easily have been the best RPG to appear on the PC in years. Another gripe, though it is minor, is that some of the dungeons feel too clean. Take for example, the Dwarven mine mentioned earlier. The corridors do not have as much debris as you would expect from a place that has been buried beneath the earth for a long while. Again, it isn’t a deal-breaker and I’m sure it’s probably explainable by somebody with a background in archaeology, but as a gamer with no knowledge of such things – it just feels like a detractor of quality. This is a mine, under the ground, left to degrade for hundreds of years. Anyway, the main point that I’m upset with in terms of armour isn’t that it’s un-upgradeable, it’s that you eventually get bored with what your companions are wearing. You eventually get bored of watching your team-mates default clothing scheme during dialogue and it sometimes feels unrealistic during combat. It’s just that I feel that some portions of a characters body should be covered during combat situations, or in situations where they are more likely to be stabbed in the uncovered region. Considering that this is a Dragon Age game, that could be in any conversation with any character within the game. If players were to customise armour, you could have them wearing armour that makes sense in a combat situation rather than them having clothes that are indestructible. Sometimes, because of the un-upgradability of the armour, it feels as though my party could be gimped in comparison to my own character which seems a little unfair and the instruction booklet makes no mention of how party armour classes work. So I could be completely wrong here, but it’s how it feels! Also, considering a lot of games are coming out that require a constant connection to the internet to run. Dragon Age 2 does not. I have successfully played through a section without an active internet connection. Though it should be noted that some DLC may not be available without an active connection, but I was able to summon my Mabari dog which is a part of a DLC package, so I’m not sure which if this affects all DLC or none at all. Just a warning. Also, if you suddenly lose connection while playing, you can fret not, as you will not be kicked from a game in progress. You will just receive a small notification that you have lost connection the server. I barely even noticed it until I grabbed some loot and noticed it was hovering over the side where it lists the coinage obtained from a corpse. Good job BioWare! Handled the online situation perfectly. <3 You guys/girls since Baldur’s Gate. Overall, Dragon Age 2 – in terms of gameplay – feels more tactical than it’s console counterparts, but also more visceral than it’s predecessor: Dragon Age: Origins. Dragon Age 2 has amazing audio, dialogue and background music. This is one of the few games that I have not switched the music off on while I have been playing. Normally at around 4-5 hours in I’ll forgo the music for my own, but not with this game. The city has a set of tunes that just fit each area perfectly, the dungeons all have an ambient feel to them thanks to the soundtrack. I know I’m supposed to write an entire section to the soundtrack, but because it fits so well and you barely notice it (like any good soundtrack), it’s really hard to come up with anything other than it is awesome. It’s all orchestrated, it enhances the visceral-ness of the combat and it just fits the game perfectly. The dialogue between characters is acted well and it feels like you are listening to a conversation between characters as opposed to a robotic transaction between programmed entities. While this isn’t always the case, and there are some parts where it can feel robotic, it is mostly fluid and natural sounding. Though the one gripe that I had with the dialogue is that it seems like they had a small pool of voice actors and a lot of characters feel like they are voiced by the same person. It isn’t as bad as I’m making it sound and it works for the most part, it’s just something I noticed and had to mention. To sum this section up I will leave you with this one message: the sound in this game eclipses that of it’s prequel as well as most other games, it is unlikely that I will be playing my own music over the top of it during my next playthrough. At the moment of this writing there are still a large amount of potentially game breaking bugs within the game. Of course, these aren’t things that can only be accessed during exploits, they are generally uncovered through normal gameplay. Take for instance a bug where sometimes a character won’t drop a quest item. This happens during act 1 in a quest that sends you out to lowtown and you have to get an item to drop off this dude. Only you kill him and he doesn’t drop it. I spent like 10 minutes looking for his corpse, only to find it hadn’t spawned on his death. A reload of my save file fixed it, but I had to go through combat again. Another bug is during the quest to obtain a certain companion. You fight with a bunch of dudes in a bar and they all drop loot. Now if you loot the corpses before she tells you to, she becomes bugged and doesn’t advance the quest like she should. Meaning you have to reload your game and try again. She’s also a personal favourite of mine and the primary love interest (out of many) for my female rogue character, so you can see why that bug is unfortunate. Somehow, this seemed less goofy at the time. Is that arm abnormally stretched? The most irritating bug however is one that is also the prominent within the game. The issue is caused by having the mouse placed anywhere in the section of screen that is active during gameplay, so that’s anywhere that’s not the quickbar. Basically what happens is that having the mouse outside of the quickbar or having the right click (which is used for turning and disappears while held) unsuppressed, you will literally lose half of your framerate. This usually wouldn’t be too bad, only the game is quite demanding, so unless you have the latest of everything it’s likely that you’ll be seeing your frames drop to a noticeable level of irritation. it’s easy enough to ignore, and I turn with right click anyway, but it shouldn’t be there at all. For a more comprehensive list of bugs, head here. It is quite unfortunate that there are enough bugs for me to warrant an entire section on them. And that section isn’t even all-comprehensive. Hopefully it will be patched soon. There is a patch out but sadly it doesn’t fix that many problems at all. I will not be including this section as a part of the games score, but I feel as though I should mention it. Coming in at 1.08 GB, this optional patch for PC users increases the texture quality to an even higher level than that already included with the game. This patch is recommended for users with a somewhat high-end card and must have at the minimum a 1GB cache on the card. It adds enhanced textures to the entirety of the environment as well as the character models and armour. While some players may not be able to tell the difference between the HD models and standard, there is a difference between them. It’s hard to say, but with the enhanced textures it feels as though the world is more clear and that some of the colours are a bit more vibrant. I’d say that for best viewing to compare would be to turn all graphical options to the maximum and then compare. As you can see, the Left hand side is slightly more detailed than the right. This is especially noticeable on the detail to the environment. BioWare certainly increased their already high reputation with me by including this option to PC supporters. 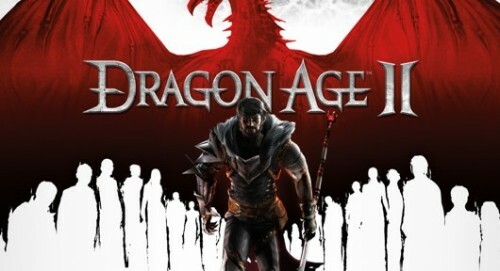 Dragon Age 2 is an excellent PC game and is easily one of the best RPGs released for the system in a long while. Unfortunately that experience is marred by a palatable amount of bugs that can easily ruin a players game. While the bugs are present, they aren’t as irritating as I make them seem… unless you get hit by a big one. The game blends fantasy elements with a story that’s more personal than fantastical which is what makes it so great. Sure there are fantastical elements and there are actually dragons in this one, which is cool. It also not only borrows events from the original but also adds to the lore of the world created in the first. By being more of a spin-off than a sequel, the game is able to implement a new feel without taking away from the feel of the original, which makes the game feel a lot more solid and able to stand on it’s own.